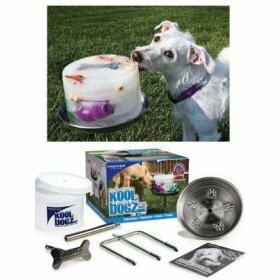 The Kool Dogz Ice Treat maker is really easy to use. Just fill the bucket with water, place the cap bar in the middle, add in treats of your choice (there are also recipes included), freeze and serve on the outdoor platform. Each Kit contains a reusable bucket (with lid), bone-shaped stainless steel cap bar and 3 piece steel serving platform. The bucket included will make an ice block about 5" tall and 7.5" in diameter. When placed on the platform the top of the ice block can either be 7.5" (without the extension post) or 14" (with the extension) from the ground. This interactive exercise toy is for hamsters, gerbils, mice and other small furry friends. There are four levels for racing fun. 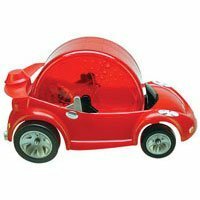 One is to snap the wheel into the lower position and remove the spoiler from the back of the car to attach it to the front of the car under the hood. Then place your critter inside and roll the Cruiser onto the Hamtrac. Second, snap the wheel into the center position and place the pet inside. This way they can cruise around the house. Thirdly, simply snap the wheel into the top position and it becomes a stationary exercise spinner. Finally you can unsnap the wheel and your pet can spin around the house. Did you know that people who care for a dog are healthier and live an average of three years longer than those who do not? Did you also know that most people with a dog regularly take walks and that walking not only burns calories but also reduces stress? Dog owners walk 79% farther in an average week than people who don't own a dog. Find these and many more fascinating fact about why dogs make us happy in David Niven's 100 Simple Secrets Why Dogs Make Us Happy. Place carob in a heatproof glass bowl. Set the bowl over a saucepan of lightly simmering water and heat until the carob is melted. Stir in vanilla extract. Use a fork to dip each piece of dried fruit into the carob so half of the fruit is coated. Then dip into chopped nuts and place on greaseproof paper. Let set for 20 min. Transfer to an airtight container and chill until hard. These treats will keep up to four weeks in the refrigerator. 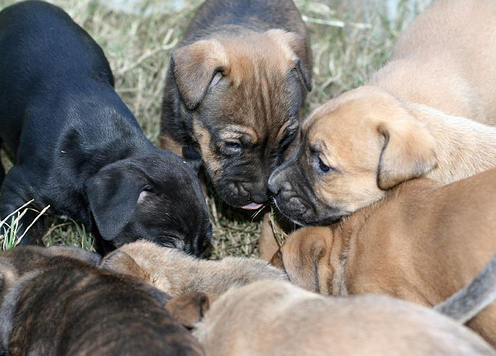 Rebecca has 10 puppies ready for new homes! They are adorable. She says they will most likely be big dogs since the mother is a bulldog mix (boxer maybe) about 90 lbs. You can see more pictures here. She will even deliver anywhere in Mississippi (and parts of Alabama). Email Rebecca.M.Benson - at - gmail.com if you want one. Forward this to anyone you know who might be interested. Dogs in Danger features dogs in over 120 animal shelters nationwide in danger of being put to death. Each dog is tagged with a death countdown clock showing the numbers of days and hours he or she has left if not adopted. 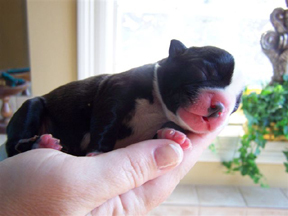 I have a friend of a friend whose Boston Terrier had puppies recently. (She owns the mom and the dad.) She has two girls and one boy that will be ready for a good home in a few weeks. If you're in the metro Jackson area and you are interested, let me know at shawn.lea@gmail.com and I will get you her contact information. Pine Belt Animal Rescue Shelter and Adoption Center takes in animals that others won't - those that require expensive medical attention and will most likely be residents of the shelter for life. Last year, the shelter made almost $64,000 through fund-raisers, grants and donations. To operate the shelter properly, Dianne Breakfield, the owner, needs about $100,000 annually. You can give donations online or raise money by shopping online. If you have more time than money, then volunteer. If you are looking for a pet, find one from the shelter here.